BEIJING – Because this city is special and it has been our home for a while. INTERNATIONAL – We may come from different countries with different languages and different culture. But we all met here because we have many things in common. The result is this explosion of music and creativity. OUTDOOR – Because the best things in summer happen alfresco. And "2 Kolegas" is the perfect place to spend the Saturday. RHYTHM – Feel the beat and the soul of our percussionists and vibrate to the sound of our dJs. The best music in just one place. Starting from 2 pm, dance ‛til you drop! 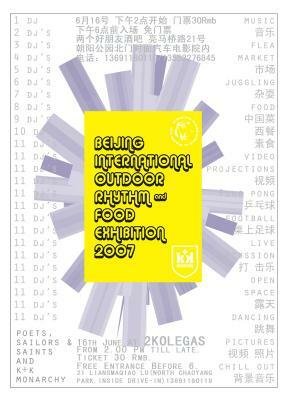 AND – We will also have side activities such as a games (petanque, foosball and ping pong) and a flea market. FOOD – In a good party you cannot miss food. We will provide a wide range of delicatessen, including Chinese "chuanr" (skewer) and Western dishes. EXHIBITION – Because every artistic expression has a place in our parties, we will enjoy pictures, juggling and projections at dusk. Ticket 30 RMB. Free entrance before 6 pm. Mari, mariiiiiiiiiii, qué envidia!!!!!!!!!!!!!!! Tenemos que hablar, que voy a España a finales de mes y voy a estar un par de semanas, a ver si nos vemos, que me encantaría!!! Muchos besicos, guapa. Te echo de menos, perri. ← Quién dijo que Pekin era gris?